We wanted to use our kayaks all year round, we also like to be comfortable. The thought of sitting in a lake or creek with the water around 34°F didn’t sound very enticing. We decided we’d try to insulate the bottom of our boats, but when we checked on-line we couldn’t find any advice on how to do it. We had a further think, and ended up buying two half-inch sleeping pads from Walmart for $5.00 each. Their closed cell foam construction meant they wouldn’t act like a sponge and the foam would also provide insulation against the cold hulls of our kayaks. For such a small investment we had nothing to lose in trying it out. To fit the sleeping pads in our Ascend D10 and FS10 kayaks we cut them roughly in half giving us two lengths of insulation the width of the pads (measure your kayak to get the best fit). The two lengths of insulation wrap around inside the hull from side to side. 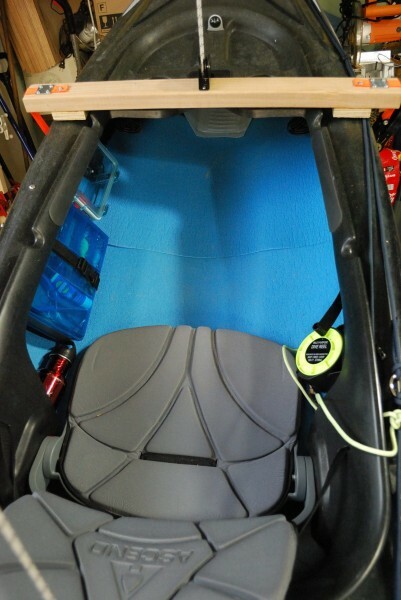 For our Ascend kayaks it worked best to cut one piece to go from side-deck to side deck and the second, front piece, to go from just above the foot rest to just above the opposite foot rest. We then cut out notches in them to go round any fittings. All that is needed for the job is a sharpie to mark where to cut the foam, and a craft knife to do the cutting. Our plan for holding the insulation in place was to use self adhesive Velcro pads. However, we found that with the front sheet of insulation fitted around the foot supports, and with the rear sheet trapped under the seat and fitting tight under the side decks we didn’t need any fixings at all. Of course other kayaks will be different. The rear sheet of insulation goes right up to the side deck, the front sheet goes just above the foot rest – which can be seen to the right of this picture. Does insulating a kayak work? Absolutely, yes. In fact it works so well we now keep the insulation in our kayaks all year round. We’ve found it very effective against the cold water, we’ve been comfortable in our kayaks even when there’s ice forming on the water. When it starts to warm up the insulation stops the inside of the hull collecting condensation where the warm moist air normally comes into contact with the cold hull. Did you secure the insulation in any way, or does it stay in place all on it’s own? Does it slide when getting in or out? It stays in place pretty well without any fixing as it is under the seat. We were going to use some strategically placed velcro tape to hold it in place, but we found we didn’t need it. If it does move it is easy to put back in place. I will try it on my kayak. I would imagine it quiets the inside of the kayak as well.